This is a great opportunity to give back to the Club while getting something in return beyond the internal satisfaction of giving. 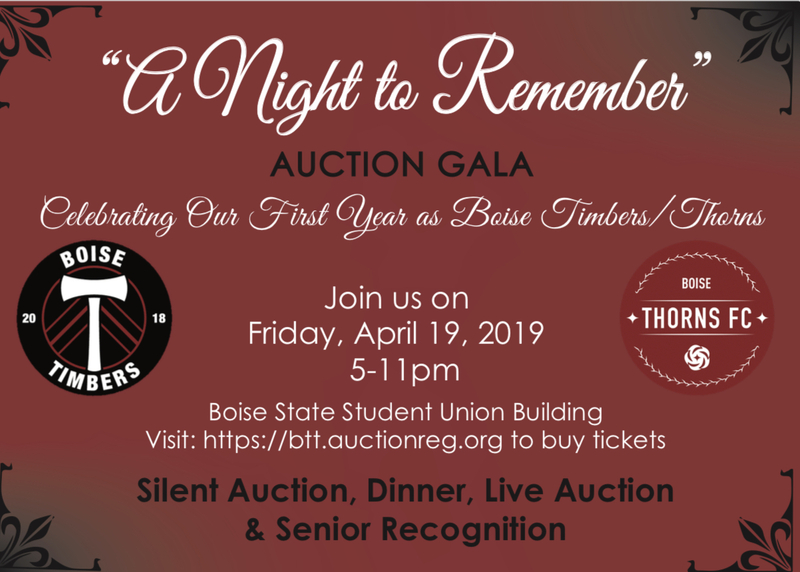 Auction Items: Bid on Signed Timbers and Thorns Jerseys; 3-Bedroom Donnelly Townhouse (2 packages), Fishing Charter on Salmon River; Steelheads Tickets; Rounds of Golf; specialized training with Ed Moore; Winery Tour; Lagoon Tickets; Ballet Idaho’s Cinderella Tickets; New Kids on the Block; Idaho Shakespeare Tickets; and many exciting team baskets and gift cards!! Helps provide scholarships for student-athletes who may not be able to play without financial support; DID YOU KNOW ON AVERAGE THERE ARE 2 KIDS PER TEAM (Not Age Group, Per roster) ON SOME KIND OF FINANCIAL SUPPORT? Thanks to all the BTT families, team managers, treasurers, fundraising coordinators, and local businesses for working to make this fundraiser a success. We really appreciate all that you do!